The Z72 continues the trend begun by Zeelander Yachts showing off her curves. Each new yacht from this builder initially makes a splash with her exterior lines and the Z72 is no exception, with a striking S-shaped sheerline. The distinctive rounded stern unfolds invitingly to reveal a spacious 100 square feet swim platform. An understated bowrail shadows the sheer for the length of the yacht. Three pairs of extremely large hullside windows punctuate the curvaceous hull. They illuminate the belowdecks accommodations, as well as subtle, flush-finished superyacht features, such as a boarding door and a side-entry garage that fits a tender and a waverunner. The superstructure has a raked, curving windshield and distinctively framed side windows, topped by a coachroof with a finely drawn grabrail. The Zeelander in-house team created the interior design of the Z72. The company takes a unique approach to yacht design, actively involving owners of its yacht in the discussion about models under development. 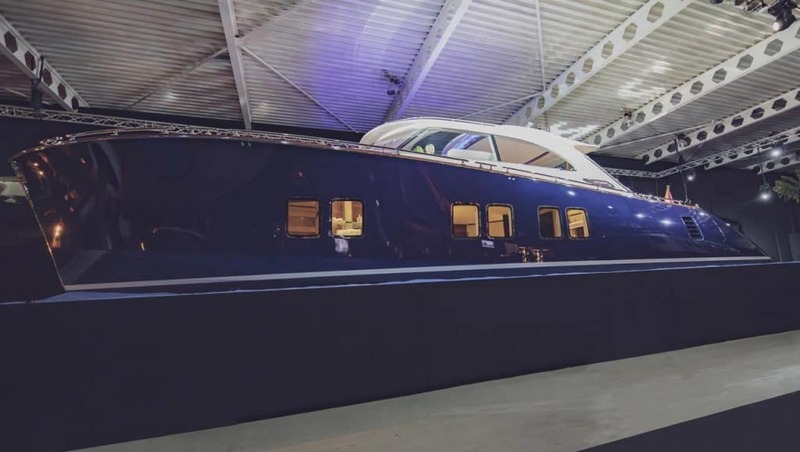 Huge expanses of glass surround the entire enclosed space of the deckhouse, which encompasses the helm area forward, backing up to a large dining table. At the aft end is a roomy, functional Ushaped galley. Abaft the stools is open deck space, sheltered by the extended house sides, followed by a step down to a fore-and-aft pair of settees with a cocktail table between. From this aft-deck area, the side decks offer easy, safe transit forward, where yet another sun pad awaits. The Z72 is even more silent than smaller Zeelander models – extra soundproofing and insulation upgraded her to mega yacht level.